Defense Minister warns right-wing parties push for annexation of Judea and Samaria will bring an immediate crisis with US. Israeli Defense Minister Avigdor Liberman (Yisrael Beytenu) on Monday attended a meeting of the Knesset's Foreign Affairs and Defense Committee. Speaking to reporters at the beginning of the meeting, Liberman discussed the recent video of Arab rioters attacking an IDF jeep. "We were shown videos which should never have been on TV," Liberman said. "An army jeep was attacked by dozens of masked Arabs. You don't know if they're going to throw stones at you, or if they'll throw a grenade or a firebomb." "Pictures like these should never be shown again. "The IDF did not act properly. There is a protocol for opening fire. I expect the Border Police and the IDF to keep to this protocol. First you shoot into the air. Then you shoot at their feet. "The fact that none of these masked rioters were injured is not okay. And I'm saying this in the name of the Chief of Staff. These pictures should never be seen again." The IDF said that the video was taken out of context and that IDF soldiers put the stone-throwers to rout soon after. 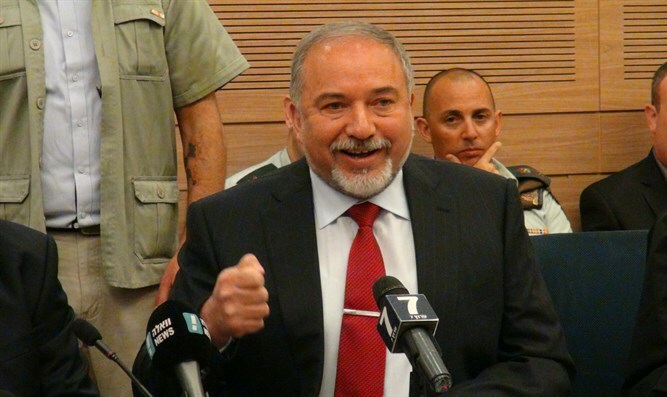 Regarding his upcoming trip to the US, Liberman said, "Anyone who wants to apply Israeli sovereignty to Judea and Samaria needs to understand that such a step will bring immediate repercussions from the new US government." "We received a direct - not indirect - message: 'Apply sovereignty and you will be cutting ties with the new government.' The coalition must explain, once and for all, that we will not apply sovereignty. Anyone who wants a crisis and who has 20 billion NIS to spare is welcome to apply sovereignty. On Gaza, he said" "We have fallen again into the trap of harshly criticizing ourselves and feeling unnecessarily guilty about the situation in Gaza," Liberman continued. "In 2016, nearly 18,000 Gazans received medical treatment in Israeli hospitals. And 800 trucks enter Gaza through the Kerem Shalom Crossing every day." "Israel has done something dramatic. We've evacuated all the Gush Katif communities, and transferred all of Gaza's Jews into Israel. We gave them every millimeter of what we conquered in 1967, and now we're faced with all sorts of complaints. "Hamas cannot continue pouring millions of dollars into tunnels and rockets, yet expect us to pay their water and electricity bills. I am not willing to romanticize Hamas' rule in Gaza."